In Someplace Like America, writer Dale Maharidge and photographer Michael S. Williamson take us to the working-class heart of America, bringing to life—through shoe leather reporting, memoir, vivid stories, stunning photographs, and thoughtful analysis—the deepening crises of poverty and homelessness. 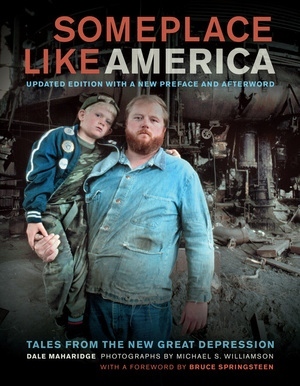 The story begins in 1980, when the authors joined forces to cover the America being ignored by the mainstream media—people living on the margins and losing their jobs as a result of deindustrialization. Since then, Maharidge and Williamson have traveled more than half a million miles to investigate the state of the working class (winning a Pulitzer Prize in the process). In Someplace Like America, they follow the lives of several families over the thirty-year span to present an intimate and devastating portrait of workers going jobless. This brilliant and essential study—begun in the trickle-down Reagan years and culminating with the recent banking catastrophe—puts a human face on today’s grim economic numbers. It also illuminates the courage and resolve with which the next generation faces the future. Dale Maharidge is Associate Professor at Columbia University’s Graduate School of Journalism. He has published seven books, including And Their Children After Them, which won the Pulitzer Prize, and Journey to Nowhere: The Saga of the New Underclass. Michael S. Williamson is a photographer at the Washington Post who has collaborated with Maharidge on many of his books.